On LG V20 removing 1x, donating, show external IP address all seem to work. Shouldn't show external ip address also show IPv6? I will report on logs and other phones later. Thanks! Right now it forces IPv4 but I can tweak that if there's a desire for IPv6. Also, I am still working on optimizing that function; right now it pings my server every time the screen updates. It's a very small amount of data, but I am cognizant that it adds up over time. New beta is out! 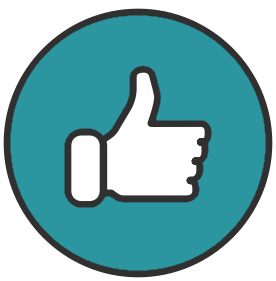 Please check out the updates from the change log and try to break it. Any feedback is welcome. The improved diagnostic reports seem to be solid, I'm mostly interested in making sure the UI makes sense. If it says they sent, they did -- if it says they didn't, they will be saved (I'll disregard any reports I come across that look like you're testing). They will be attempted again when another new report is attempted to be sent, or by going to the Send Diagnostics screen and clicking "Send Saved Only". Hiding 1X and configuring where the Reset button appears are significant new options. Very cool! I'll take my Verizon phone out with me tomorrow and try to do a diagnostic while I'm out and about. Then, when I get home, I'll try to submit it via Wi-Fi. 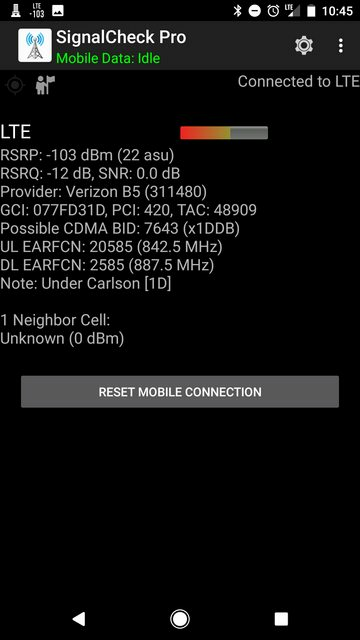 In this latest beta update, the icon for Verizon's Band 5 is broken. It just has a regular "LTE" icon now without "B5" on it. Bands 2, 4 and 13 work just fine, however. Hmm.. I just double-checked the code and graphics, and it all seems to be ok. It worked fine on the previous release (4.43)? Send me diagnostics when you see it again if you can. Got me stumped for the moment. Sent it in. Let me know if it worked. Moto G Play, saved around 1:45PM? Received it around 6PM! I did notice some unrelated errors related to getEarfcn() routine, but they are timestamped 6/20.. have you not rebooted that device in awhile? At first I thought that shouldn't impact anything, it's the same GCI in both screenshots so that rules anything like that out.. but I just got a report from @lilotimz showing a similar icon issue on T-Mobile Band 4. Then I noticed your Verizon GCI ended in 1D, which isn't pre-identified by the app; you're seeing a band indicator from the Android 7 routine. So I think I know where to start looking.. send that report if you have a chance though. You know what, something that I bet caused it was that I moved from the latest Android O Preview 3 back to Android 7.1.2. Sorry, totally should have mentioned that. Is the O codepath different? Yep, that's it. I wasn't reporting anything in particular, just wanted to be sure you had at least one outside test of the saved submission functionality. And I don't reboot my devices unless it's necessary. The last time I rebooted that phone was probably in May when I turned it off for the flight back from Denver. After I caught up on S4GRU and saw littlejth's post, I went through the reports and saw a few from you since Monday morning with the same issue -- your reports are what helped clue me in what I had broken..
Nope, that should not matter in this case. But, good news.. I think I found the bug, I think I squashed it, and I just pushed out another beta update. Resolved a separate minor bug with the LTE title on the main screen as well, I don't think that was updating immediately in certain scenarios. Try it out and let me know! App doesn't even open now. Force closes on start. Got that warning from Google's pre-launch testing service several minutes after I uploaded. Can't figure out why, compiles fine on my end.. was hoping it was a glitch on their end. I'll update shortly..
EDIT: I have no idea what the issue was.. I resaved, recompiled, and re-uploaded it, and suddenly the APK is 900kb larger. Google didn't throw any testing errors this time, so give it a try. SCP does load correctly on a LG V20. 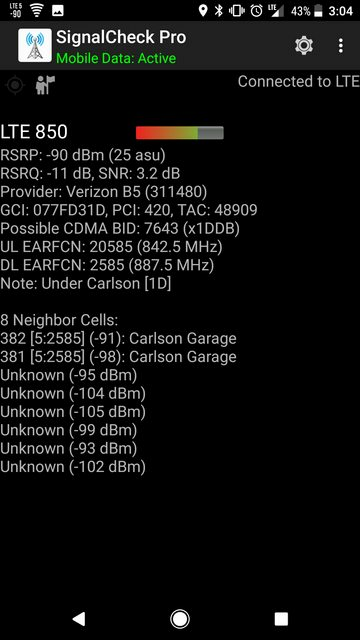 With more screen space with the 1x with LTE toggle, I have noticed the long list of unknown neighbors. If there is no usefull data such as PCI or EARFCN, I don't see the value of displaying them. I was excited at first reading about adding location to notes thinking you were adding a site location column(s) so RSRP could be used for its original purpose (rather than setting it to -1 to fix the location to the site location). I do think the here button will be useful to many. Too much bad memory management by the apps and OS to wait that long. I reboot every few weeks to a month at a minimum for a more stable phone experience. You can go longer on newer phones than before. Considering these phones are literally only used for SCP/NSG, I've rarely encountered such issues. My bigger problem, actually, is the constant prompting for updates that I can't install because I've replaced the bootloader. I can kill them, but on reboot, the prompts start right back up again. If rooted, did you try press and hold on these messages which then allows you to delete them? Or fotakill (beware of fakes). LTE 850 appears to be working fine now on the latest build on my Google Pixel. Excellent! It wasn't band-specific, it was bad logic on my part. Only would have affected a relatively small percentage of users in very specific circumstances (as you noticed) so I'm glad you guys caught it, thank you! Lurkers, good news.. I hope to make the current version the public release, as long as no more bugs pop in the next few days. I still intend to add some columns to the database, just trying to tackle the issues that impact the most users first. I know you and @Trip will do a little dance when that happens! In the change log, you mention this: Added feature to add current location to a site note. I just now found it, having thought it meant something else. But my first attempt at using it, sitting here in my office at work, said "Location unavailable!" even though I have GPS coordinates shown at the top of my screen. (The GPS is not currently locked, however, since I'm indoors.) Not sure there's a bug here, but wanted to point it out.